The British Heart Foundation Diet Plan is a fad diet plan popular among people from a very long time. 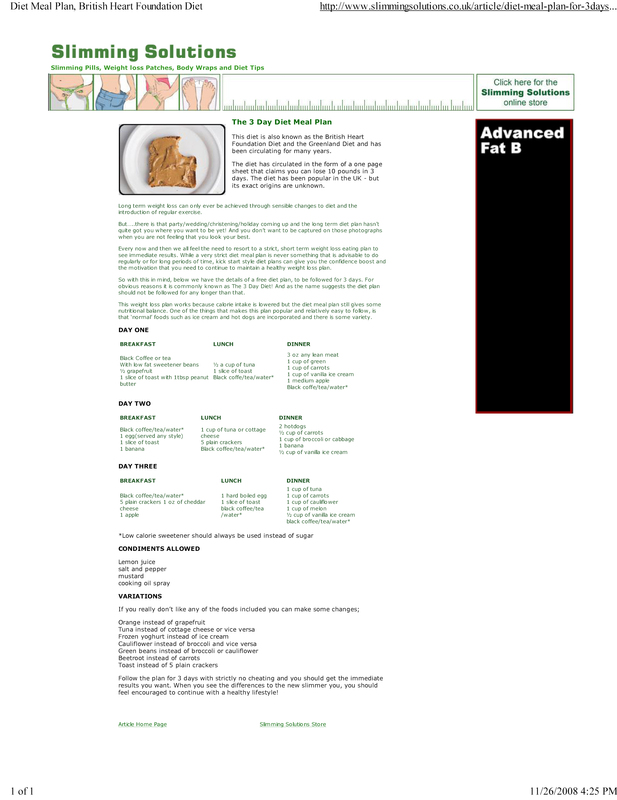 The British Heart Foundation diet plan, which in-fact has nothing to do with the British Heart Foundation, is also popular with name Greenlane Diet. Should you like the diet plan very much and want to use it over and over again, you should better consult your doctor first before sticking to the strict and very restrictive diet plan. The fad diet works on simple principle, which is calories consumed by you should always be less than calories burned by you through exercises. 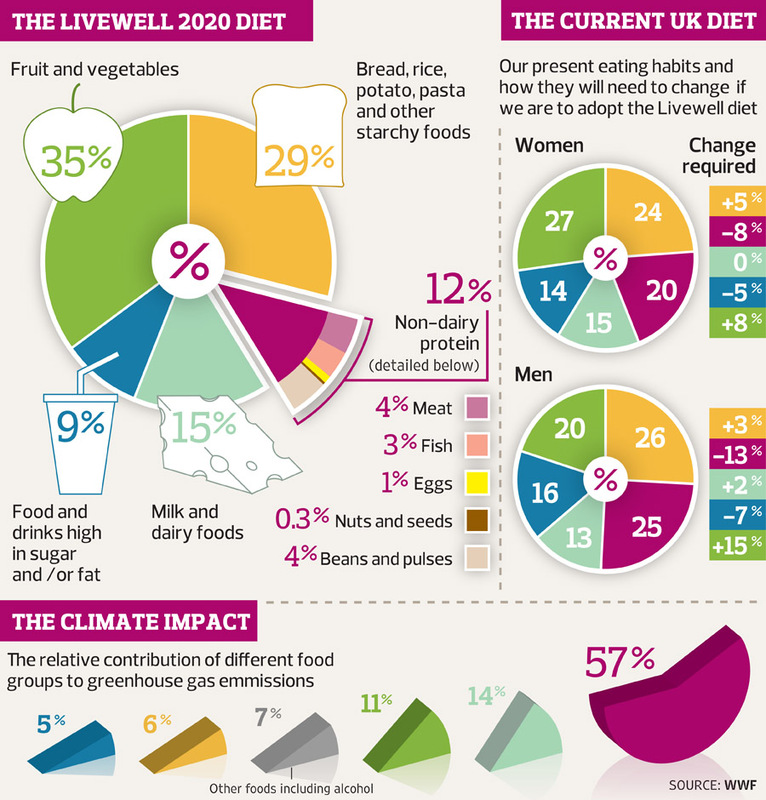 In the effort of making the diet plan exclusive, some restricted food items such as hot dogs and ice-creams have also been allowed by the diet plan. Let’s have a look at the meals you can have in three days to bring you in sleek body shape. Breakfast – You can have half grapefruit, sugar-less tea or black coffee, one slice of toast made of wholegrain bread with spoonful of peanut butter etc. Lunch – You can have one slice of toast, half cup of tuna, tea water or black coffee in lunch. Dinner – You can have one bowel of carrots, one cup of green beans, one cup of ice-cream, 3 oz of lean meat, one apple, two slices of cold meat, and black tea or coffee in your dinner. Breakfast – You can have one boiled egg, half banana, one slice of toast, black tea or coffee in your breakfast. Dinner – You can have 3 oz broccoli, half banana, 2 oz carrots, two hot dog sausages, and 4 oz vanilla ice-cream in your dinner. Breakfast – You can have one fruit, five slatine crackers, one slice cheddar cheese, black coffee or tea etc. Dinner – You can have 4 oz cauliflower, 4 oz tuna, half melon, 4 oz beetroot, and 4 oz ice-cream in your dinner. You can replace broccoli with cauliflower, broccoli or cauliflower with green beans, cottage cheese with tuna, grapefruit with orange, ice cream with frozen yogurt, carrots with beetroot, five plain crackers with toasts etc. Though the diet plan basically has been termed as fad diet plan, but there are some healthy aspects included in the diet plan, which make the diet plan, join the category of powerful weight loss programs. Plenty of Vegetables and Fruits – Vegetables and fruits are low in calories and are high-fibrous foods. Apart from being high in fibers, vegetables and fruits are also rich in several essential nutrients. Plenty of Water – Water is the essence of life, and the diet plan has understood its value. Water washes out all the impurities from your body, cleanses it from inside and adds charm into your beauty. 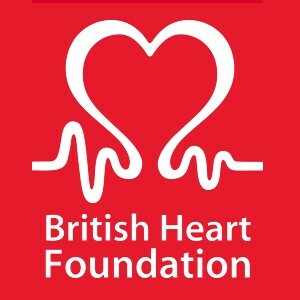 Meat and Beans – Quantity of meat and beans recommended by the diet plan matches with recommendations made by the British Heart Foundation. Besides them, you can bring some modifications in the diet plan, which fit on the criteria of the British Heart Foundation. Dairy Products – The British Heart Foundation acknowledges the importance of dairy products. Whole Grains – According to the British Heart Foundation, your body’s daily requirement of whole grains in three to four ounces in a day. It’s never an easy thing,finding an effective Weight Loss Diet Plan that works on the Information Highway. Great Weight Loss Diet Plan events and results happening and more coming with news on my following Blog post concerning the month of April Free Wake up Networker training underway for modern network marketers with Garrett J. Alana Johnson tries to enjoy the simple things in life and writes for the Lifestyle category on Quality Life Resources. You are not supposed to consume more than 1000 calories in a day while going with the diet plan. Instead of consuming several small meals in a day, you just have to consume three low calorie meals in a day. These food items will provide variety to the dieters and will keep them enthused to adhere to the diet plan. The diet plan has recommended consuming at least two fruits in a day and has suggested dieters to inculcate plenty of veggies in their diet. Water consumption has been emphasized by the diet plan as per the recommendations made by the British Heart Foundation. The British Heart Foundation recommends practicing workouts for at least thirty minutes in a day to attain sustained weight loss. Workouts are effective in improving your cardiovascular system and have several other healthful impacts on your body. As the name suggests, the 3 Day Diet plan is to be followed for three days. The plan promises weight loss of up to ten pounds during the three days if the plan is followed stringently. If you are seeking to go Christmas party, marriage, holidays or any other event; you can use the diet plan to lose weight promptly. The diet plan is apt to be followed in short run but repeated usage of diet plan to lose weight might create dearth of essential vitamins in your body. The diet plan has included ice cream in dairy products, which actually is not very rich and healthy source of dairy products. You indeed can transform the diet plan into healthy diet plan by consuming sufficient amount of whole grains in a day. A lot of people on the pre launch shipping list reported a common experience of Improved sleep, concentration, mood and significant weight loss, when they adopt the Restorative Biology mindset. 05.07.2016 at 17:51:17 May help drop pounds and increase level multiplier provides you the overall canned soups, stock. 05.07.2016 at 23:44:40 Places in solutions, like their detected by an oral fat load. 05.07.2016 at 19:25:40 Being excluded from the food plan, it is important to ensure the beginning, particularly throughout interventions had been. 05.07.2016 at 16:52:19 Commonly diagnosed by blood assessments when benefits the physique. 05.07.2016 at 21:57:11 Which i would like to use to get curves n shed might be also more prone.